Through a special survey conducted by the Smith Polling Institute for Hiddush, we measured the impact of a party’s commitment to pursue religious freedom and equality in shouldering the civic burden on its likely voters’ decision to vote for it. The findings clearly indicated that issues of religion and state carry a great deal of weight in Israeli Jewish voters’ decisions on whom to vote for in the upcoming elections. They further confirmed the findings of surveys conducted in the summers of 2018 and 2017, demonstrating the importance of the principle of freedom of religion and equality for the voters of the civil parties, including the Government Coalition parties. The voters expressed their preference for parties that commit themselves to working for and advancing these principles, over other parties that share similar political outlooks on security and economic issues. Such intention was express by 64% of those who have not yet decided whom they will vote for, and 52% of the general adult Jewish population! The percentage of respondents who say that a political party’s firm stand for religious freedom and equality of civic burden will increase the likelihood that they will vote for it is especially large among those intending to vote for a the Israel Resilience Party [Hosen L’Israel] headed by Benny Gantz [67% - will increase, only 3% - will decrease]. 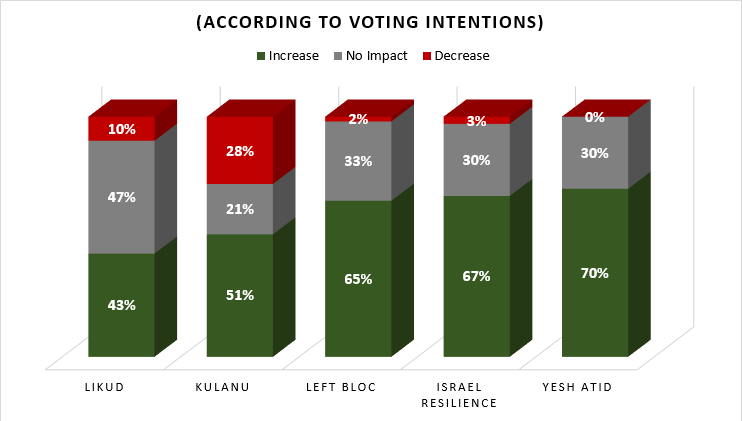 The left bloc, including the Labor Party, Meretz and HaTnua: 65% - will increase, only 2% - will decrease]. Yesh Atid Party: 70% / 0%. Gesher Party* headed by Orly Levi-Abekasis: [71% / 5%], Yisrael Beiteinu* [57% / 6%]. Even among those who intend to vote for Kulanu, a majority of respondents feel that the commitment to promote religious freedom and equality of civic burden would increase the likelihood of them voting for the party: [51% - increase, 28% will decrease]. 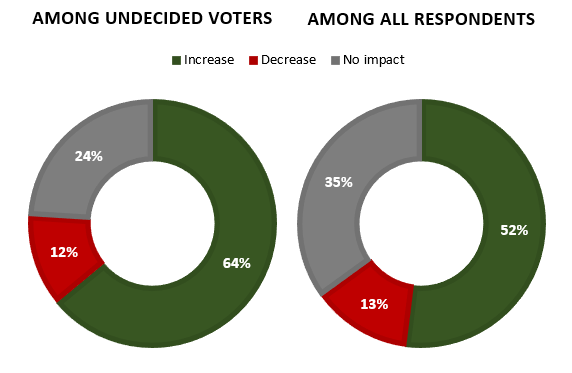 Of particular significance is the fact that 64% of those who have yet to decide whom to vote for responded that such a stand would increase the likelihood of their voting for such a party, compared to only 12% who said it would reduce the likelihood [and 24% who said that this would not affect their vote]. The political significance of these figures is clear. Hiddush surveys show that the public hopes for an end to the perpetual kowtowing of the right as well as the left wing parties to the religious parties on religious issues. Most of the public, and most of those who are still debating whom to vote for, will reward and favor parties that will break out of this pattern, will ensure the promotion of freedom of religion and equality of the civic burden, and will act in this spirit in the Knesset and in the Government. Benny Gantz's speech this week was the first volley in the election campaign of a party that has chosen to listen to the public, and we hope that the other civil parties will follow suit. In the coming weeks. Hiddush will continue to monitor the public's views on religion & state and their influence on the elections and the government coalition that will be formed afterward. A comparison of the three surveys reveals a consistently increasing gap in favor of those who say that the commitment of a party to promote religious freedom and equality of civic burden will increase the likelihood that voters will vote for it, compared to those who say that this would reduce the likelihood that they would vote for it: 39% in the current survey [52% - will increase; 13% - will decrease], 38% in the summer of 2018 [57% - will increase; 19% - will decrease], and 36% in the summer of 2017 [56% - will increase; 20% - will decrease]. However, the current survey shows an increase in the percentage of respondents who answered that this matter is unlikely to affect their vote [35% in the current survey compared to 24% in the 2018 and 2017]. This can be understood in light of the fact that the two previous two surveys were conducted long before the election date was known. In contrast, the current survey was conducted when the election campaign had already begun, the identity of the competing parties was largely known, and the issues regarding the investigations against the Prime Minister and those related to security were already occupying a central place in the candidates’ rhetoric and in the public discourse. Operation of public transportation on the Sabbath - 21%,; Reducing budgets for yeshivas and the religious establishment - 21%; Recognition of civil marriage and divorce - 20%; Revoking the Chief Rabbinate's monopoly on the granting of kashrut certification – 15%; IDF enlistment of Yeshiva students - 14%; Opening convenience stores on Saturday - 12%; Recognition of conversions of all major streams of Judaism - 7%; Enforcement of core curricular studies in ultra-Orthodox education - 6%. Among the secular public [47% of the sample] 66% responded that they are more likely to vote for a party if it commits itself to promoting freedom of religion and equality in the Knesset and government [Compared to only 3% who said this would reduce the likelihood, and 31% said that this would not affect their vote]. Also, among those who are "traditional - not so close to religion" [18% of the sample], 58% responded that this would increase the likelihood of their voting for such a party, compared with only 9% who said this would reduce the likelihood. Similarly, even among the "traditional – close to religion" population [13% of the sample], 47% say that a commitment to promote freedom of religion and equality of burden will increase the likelihood of their voting for a party, and only 12% say it will reduce the likelihood. As we have noted in the past following periodic and annual Hiddush surveys, there is a significant percentage of the Modern Orthodox public that supports positions of religious freedom and equality of the civic burden. In the current poll, 27% responded that a party's support for freedom of religion and equality of burden would increase the likelihood that they would vote for it. The survey was conducted via phone on 16-17 January 2019 among 571 people, a representative sample of Israel's adult Jewish population (ages 18 and over). Sampling error - ± 4.3%. 1. If an existing party, which suits your political outlook on security and economic issues, commits to the principles of freedom of religion and equality of the civic burden and will act to advance these in the Knesset and in the Government if it participates in the Government Coalition - will this increase or decrease the likelihood that you would vote for it in the next elections? 2 and 3. Which one of the following issues, if the party you are considering voting for will act openly and vigorously to promote it, would most increase the likelihood that you would vote for it in the next Knesset elections? And which issue would be second-most important? •	Care should be exercised when drawing conclusions because the number of cases in the sample is small.